It’s hard to believe that so many Australians still consider the WS Cox Plate to be a key prep race for the prestigious Melbourne Cup. In its own right, the Plate has an extensive history of drawing the best turf horses in the nation whether they intend to go on to the Cup or not. This is the kind of race that has punters scrambling for the best free bet offers and online betting signup offers. Given the popularity and timing of this race, it’s fair to consider it a prep for the Cup. As one of the centerpieces of the Melbourne Spring Racing Carnival, The Cox Plate stands as the spring target for many of the nation’s top horses and human connections. This year’s Group 1 WS Cox Plate is scheduled to be run on October 22, 2016 at the Moonee Valley Racecourse in Melbourne, Victoria. The race will be run at a distance of 2040 meters on grass for a purse of AUS$3,000,000. Under the race’s conditions, 3-year-olds and over will lineup with set weights based on allowance conditions with penalties. The WS Cox plate, which was named after the founder of the Moonee Valley Racing Club, was inaugurated in 1922. It is generally rated among the top 10 turf races currently being run anywhere in the world. Here is a list of past winners that went on to become some of the greatest race horses in Australian racing history: Phar Lap (twice), Chatham (twice), Tulloch, Tobin Bronze (twice), Kingston Rule (3-times), Strawberry Road, Sunline (twice), Northerly (twice), So You Think (twice), Makybe Diva and last year’s winner, the brilliant mare Winx. As a premier middle distance race, the Cox Plate draws horses that are stretching out and others that are dropping back in distance. That creates a unique challenge for handicappers who need to determine which horses best fit the conditions of the race. It’s worth noting that true stayers often struggle with this race while milers have had a great deal of success. Above all, current form seems to be a key handicapping factor for this event. With several key preps for this event already in the books, two prominent contenders would seemed poised to have their names scribed in the race’s history for eternity. Winx: The word superstar is used to describe horses that come along and simply dominate the sport for as long as they are on the track. The great Phar Lap and Black Caviar come to mind. Winx is in that class. In 21 trips to the barrier, this brilliant 5-year-old mare has won 15 times and accumulated over AUS$7,000,000 in purses. She is currently on a 11-race winning streak that includes last year’s edition of this race. With two nice preps already in the bank, Winx is the most likely winner of this race at very short odds. Black Heart Bart: It took this 6-year-old gelding a lot of races and close calls before he finally broke through with a big win in last season’s Group 1 Goodwood Stakes. Since that time, his form continues to improve as he came back earlier this season to claim the Group 1 Memsie and Underwood Stakes with a second place finish in the Group 1 Makybe Diva Stakes. Any other year, he would be a heavy favourite to take this race. This isn’t any other year. For any punters who want to wager on this race, now would be the ideal time to find the best free bet offers and online betting signup offers on the Internet. With lots of great sports and horse racing action scheduled over the next couple of months, it would be nice to have a few more bullets in the gun. 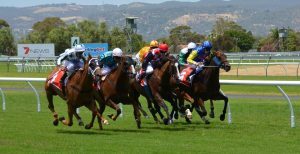 As an avid horse race handicapper and veteran of online betting his contributions about Australian bookmakers can be found at freebetsbonus.co.nz. I think you made a typo and meant Kingston Town Trev. Secretariat’s son never won a Cox Plate, although he did do what the King never could and won the big one.